Depending on store size, shape and the surroundings we have the following 3 main versions of store fronts. Store front with portal is our primary store front solution. 1. Logo constructed as described on page 11-12. Construction colours are always blue with white elements. The portal “legs” should always be narrower than the “top part”. The logo should as a rule align with the width of the entrance. should follow the principles from page 12. Centering it on the blue surface. needs to take into account that the top part does not simply end up looking like a ribbon (first example below). the width of the glazed area below. The portal legs should be narrower than the top part is high. Preferably a width of half the height. The height of the top should not be more than 3 times the width of the portal legs. The store front band is mainly used on stores placed in shopping malls and only if the surrounding stores has the same type of store front signage. The logo should be illuminated as cut out elements. 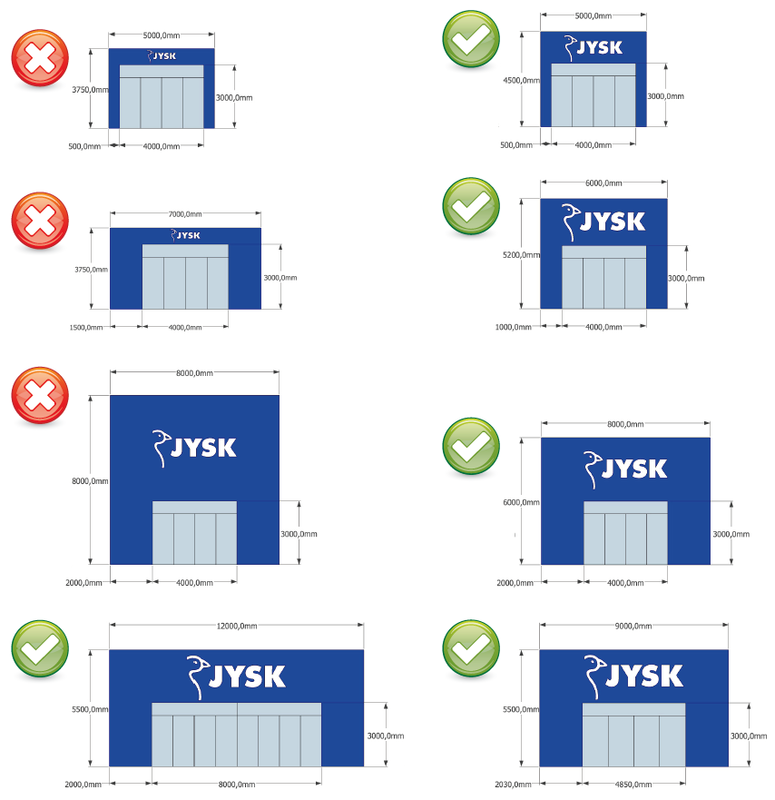 A store front band should in general start and end with a JYSK logo. On stores in shopping malls we prefer to have a logo sign perpendicular to the store front to increase visibility.